VANCOUVER, British Columbia, May 23, 2018 (GLOBE NEWSWIRE) -- Aben Resources Ltd. (ABN.V) (OTC PINK:ABNAF) (E2L2.F) (the "Company") is pleased to announce plans for the upcoming summer drill program at the Forrest Kerr Gold Property located in Northwestern British Columbia`s Golden Triangle region. The Company is planning a 5000 metre diamond drill program commencing in mid-June. The initial focus for the drill program will be to expand the high-grade precious metal mineralization discovered in 2017 at the Boundary North Zone, located near the center of the Forrest Kerr Property. Three separate drill holes, collared from the same drill pad, pierced a near-surface high-grade zone of gold-silver-copper mineralization, in addition to broad intercepts containing gold bearing quartz veins. Select results from those holes include 6.7 grams per tonne (g/T) Au, 6.4 g/T Ag and 0.9% Cu over 10 metres, including 18.9 g/T Au, 16.6 g/T Ag and 2.2% Cu over 3.0 metres in hole FK17-04 which contributed to an average grade of 0.26 g/T Au over 387 metres. Hole FK17-05 returned 21.5 g/T Au, 28.5 g/T Ag and 3.1% Cu over 6 metres from the same zone at a slightly greater depth. 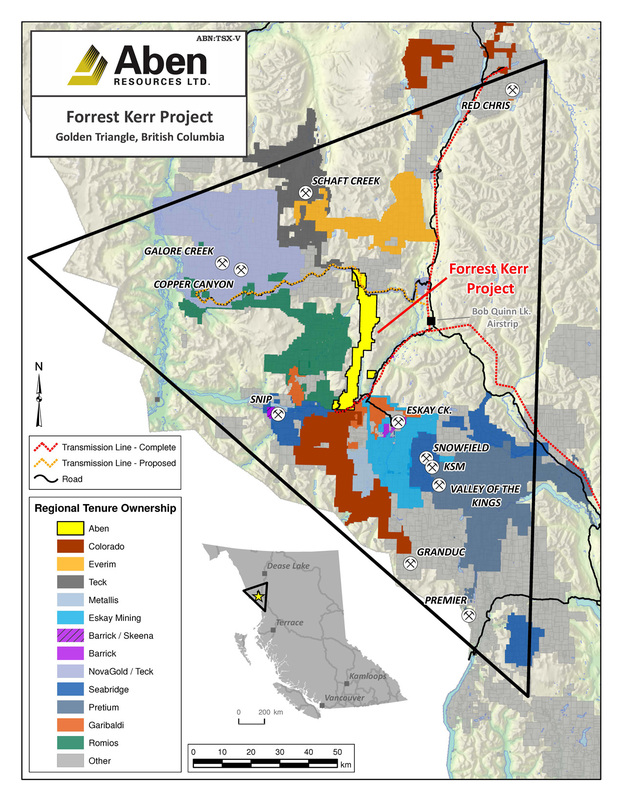 The Company`s President and CEO, Jim Pettit, stated: "Notable regional discoveries by Pretium, GT Gold, Garibaldi Resources and others have illustrated the significant discovery upside remaining in the district and we are confident in the potential at Forrest Kerr given the newly discovered and historic high grade mineralization there as well as the numerous untested gold-in-soil anomalies present". Aben currently owns certain mineral tenures outright and has agreements in place with various third-parties whereby it has the exclusive right to a 100% interest in the 23,000 hectare property area. Aben Resources is a Canadian gold exploration company developing projects in British Columbia`s Golden Triangle, the Yukon, and Saskatchewan. Aben Resources has approx. 78.3 million shares issued and outstanding.